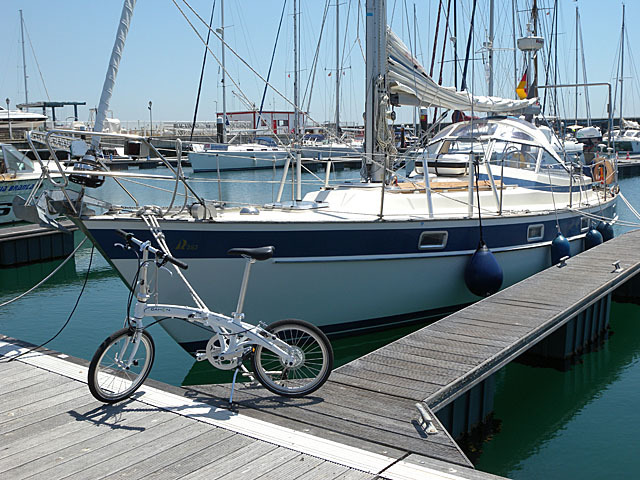 We started late today because the harbourmaster was not there before 09:30. 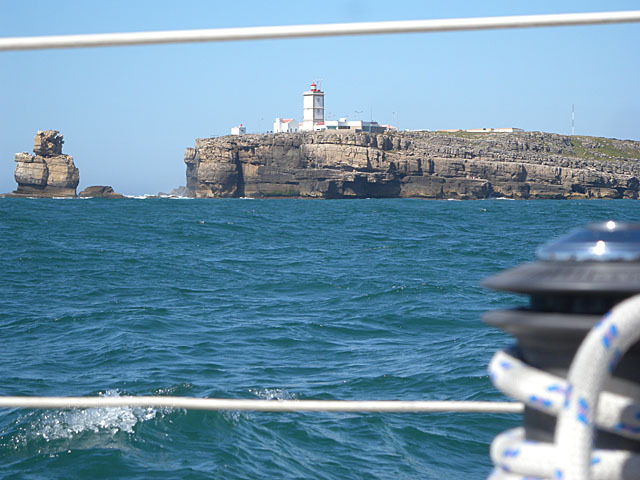 We left Peniche at about 10:00 local time and motored out of the harbour. 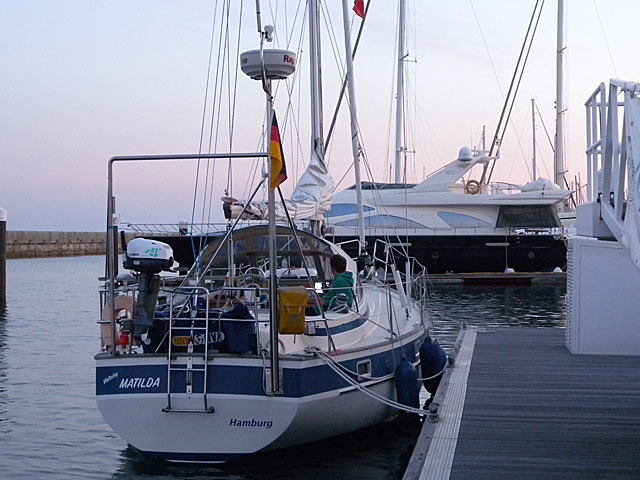 Just before hoisting the sails the engine buzzer started beeping loudly indicating that something was wrong. 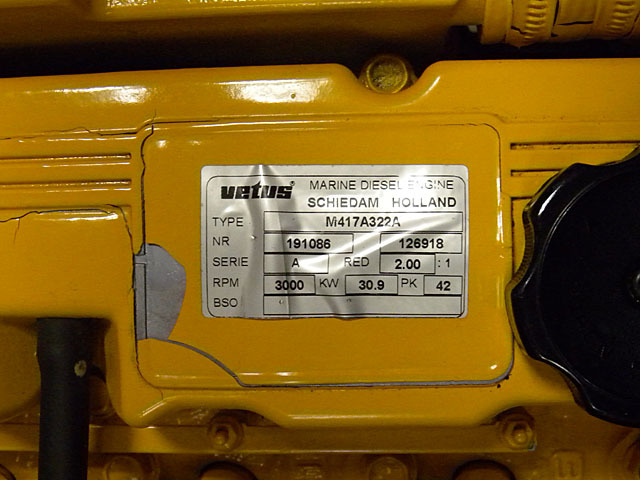 We switched the engine off and tried to understand the problem. The engine panel light burning was indicating too high temperature for the outer cooling circuit. There was enough cooling water coming out of the exhaust; the impeller was working. There was also enough oil and cooling liquid in the inner cooling circuit. Then we realized that the engine main block was getting too hot. We had a cooling problem indeed. It was not just a faulty temperature sensor. And it was not the outer cooling circuit. Most likely, it is either the thermostat that adds the outer cooling system when the engine has reached a certain temperature or the inner circuit pump. 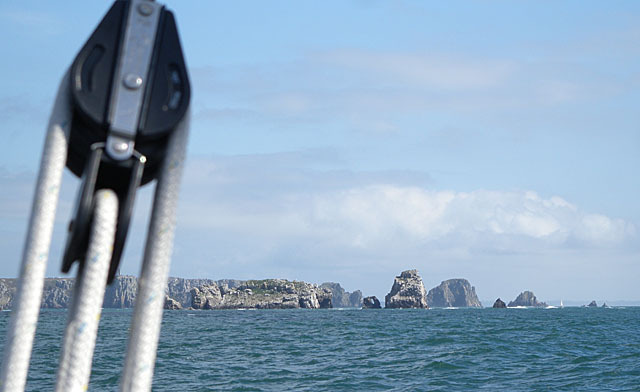 The wind had fleshed up a bit and Peniche was now lying about 5 NM behind us. The engine was out of order. 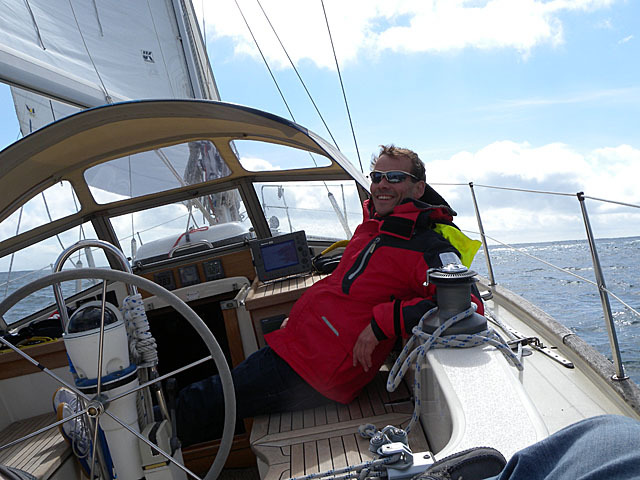 The question was now: Do we sail back into Penich where we could be in one hours’ time and where we know what to expect or do we sail south the 50NM to Lisbon with the risk of not arriving in daytime in an area we had never been before? I took the decision to sail to Lisbon. The weather was expected to be the same as the past days. 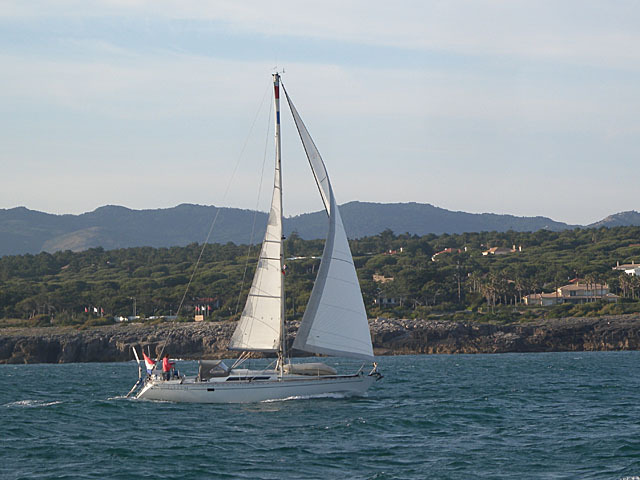 With the Nortada blowing at F5 we could arrive in Cascais at about 21:00. 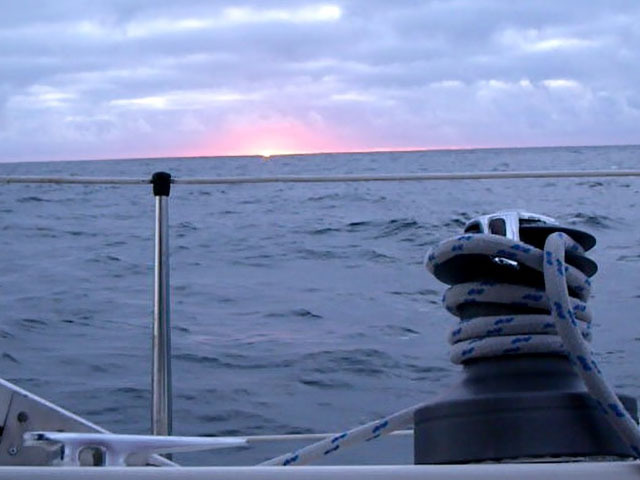 If not we would stay outside and try to sail into the harbour with the first daylight. We switched off most of the appliances that weren’t necessary in order to save battery power, hoisted the main and headed south. 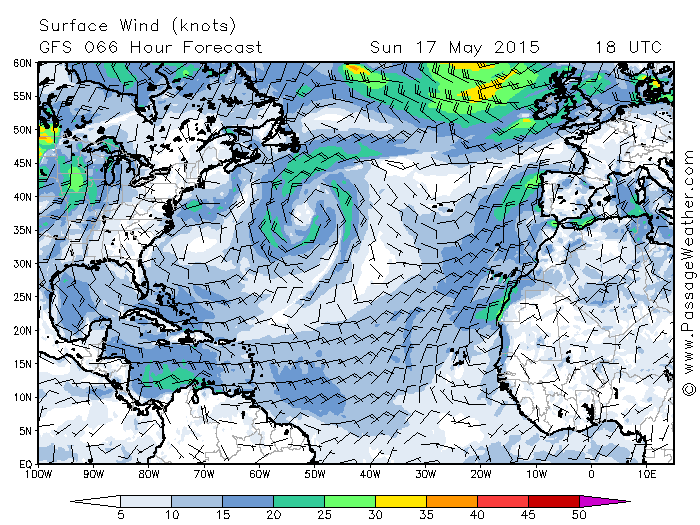 The Nortada was reliable and with all sails up we accomplished the remaining 50 NM in about 8 to 9 hours. 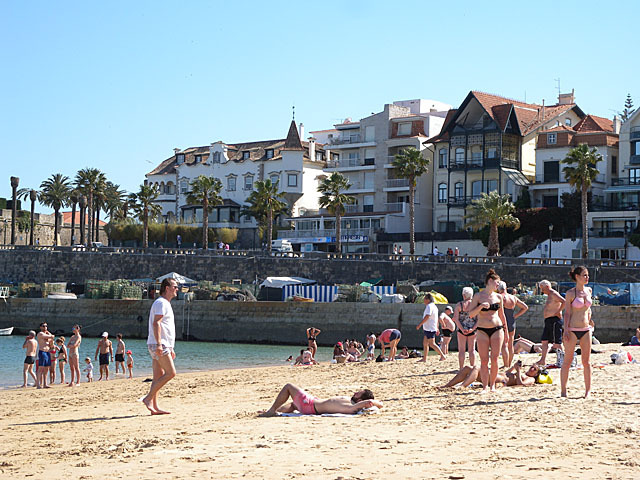 I contacted Cascais Marina. 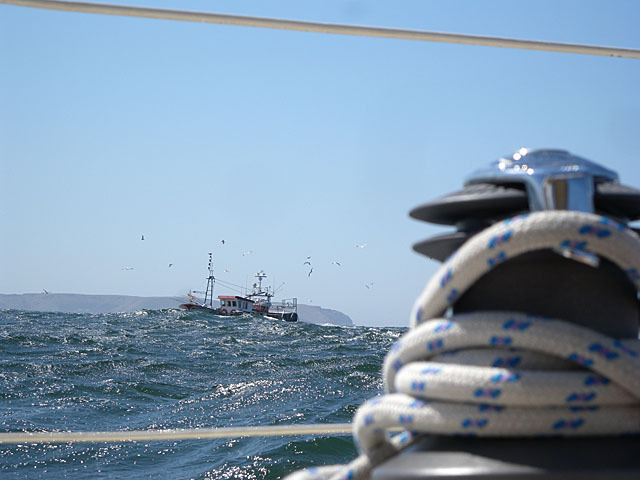 I told them about the engine problem and that I would have to sail into the harbour, they offered assistance and sent out a RIB at the harbour entrance which towed us safely into a berth. The destination of the second leg of the voyage was reached. 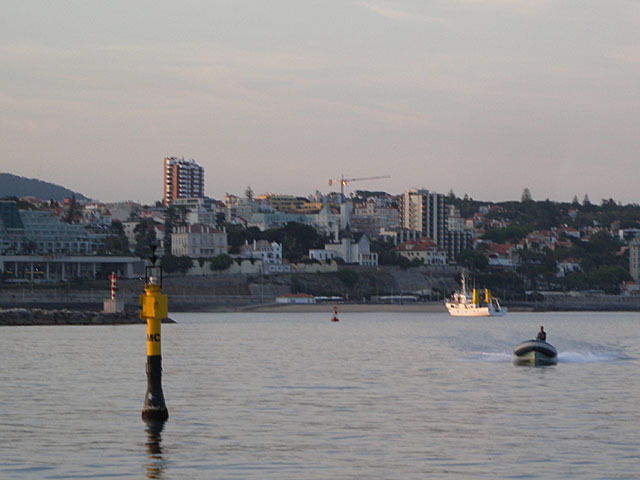 We were lying in Cascais Marina at the mouth of Rio Tejo which leads to Lisbon. Yesterday Figueira da Foz, today Peniche, tomorrow Lisbon. We started early in the morning again (6:00) in order to arrive at a time where the marina office is still open but without success. It is supposed to be open until 18:00 Portuguese time, but it was closed. Again no access to the toilets and showers and even more annoying no card for opening the gate to the marina. 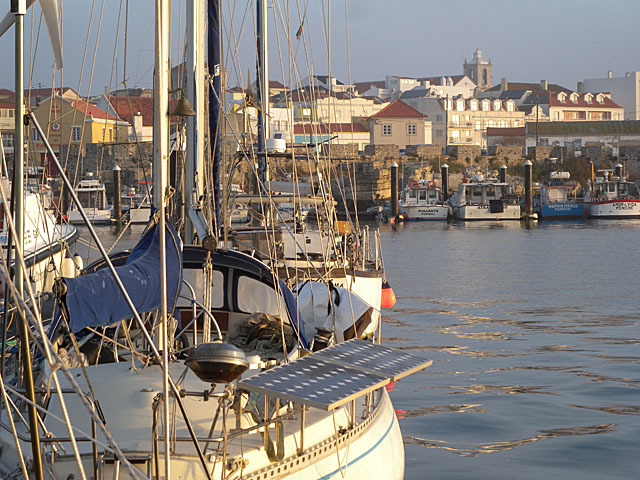 Peniche is one of the most important fishing harbors of Portugal and there are many fish restaurants at the promenade. We will definitely not stay on board and will probably have to climb over the marina gate when coming back. 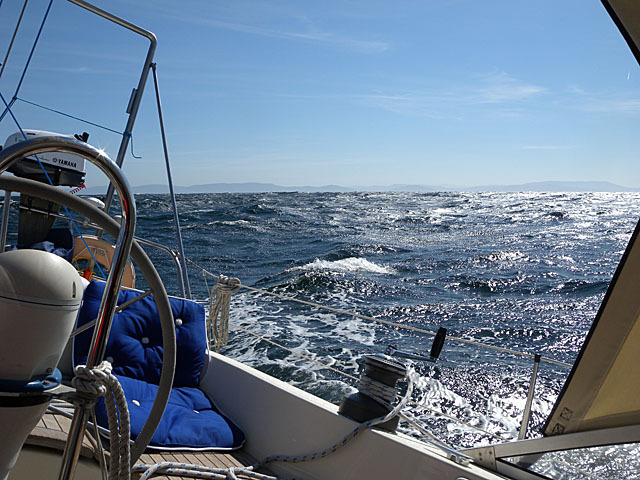 Bothe sailing days were great with nice Atlantic swell and a steady Nortada /Portuguese trade winds) blowing at about F4 – F5. Every day at about 18:00 – 19:00 when we are arriving at our destination, the wind increases to about F6 – F7 adding this little extra kick to the maneuvering in the unknown harbour. Another great sailing day. 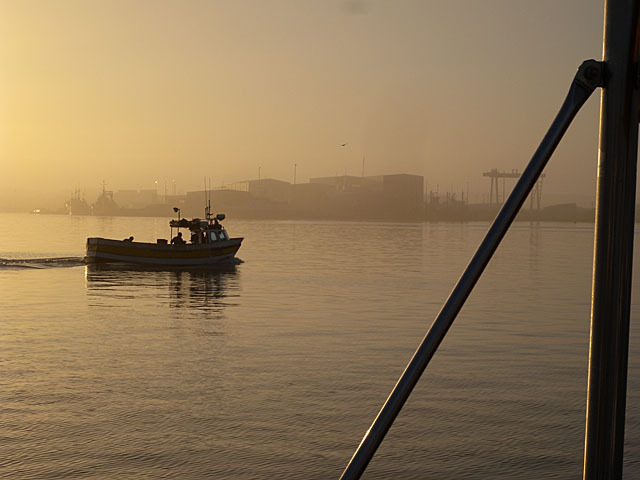 We started early in the morning at 7:00 in order to arrive at Leixoes before 19:00. The day was sunny and the wind was blowing F6 from NNE. We made good progress and arrived early in the evening with the wind gusting F7. 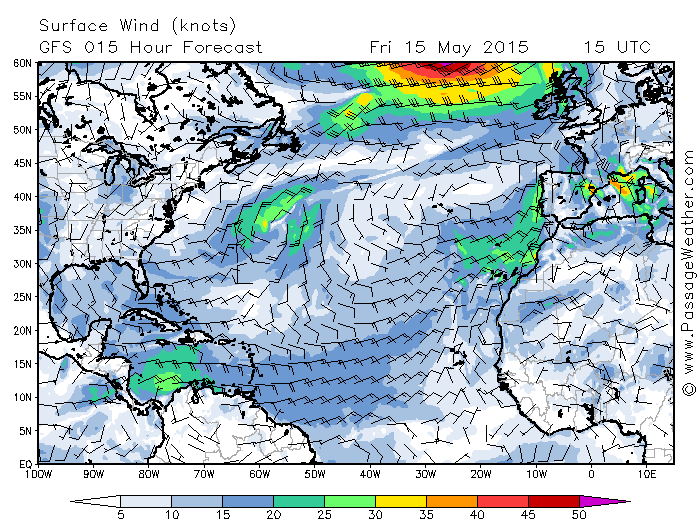 The Portuguese trade winds seem to be quite reliable starting at about 10:00 and blowing till sunset. Tomorrow will be spent exploring the town of Porto. Yesterday was the best day so far. We have been surfing up to 4 meter big following waves for 12 hours in a run from Camariñas to Baiona. 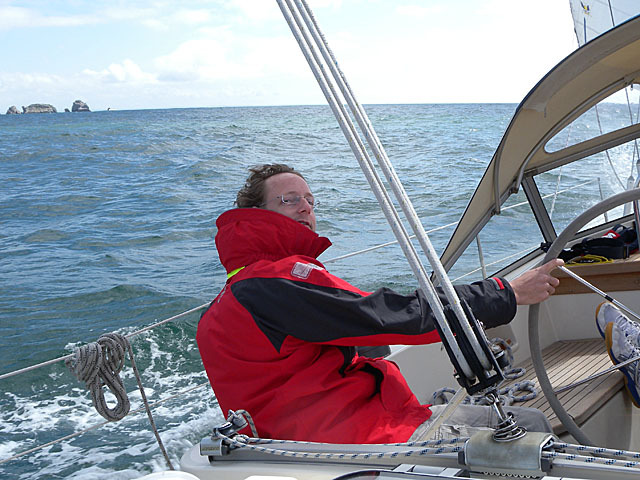 It was a sunny day and real “blue water sailing”. Matilda being a long (-ish) keel yacht could not have behaved better providing a great sense of safety. The autopilot had little to do, most of the time the steering wheel did not move. 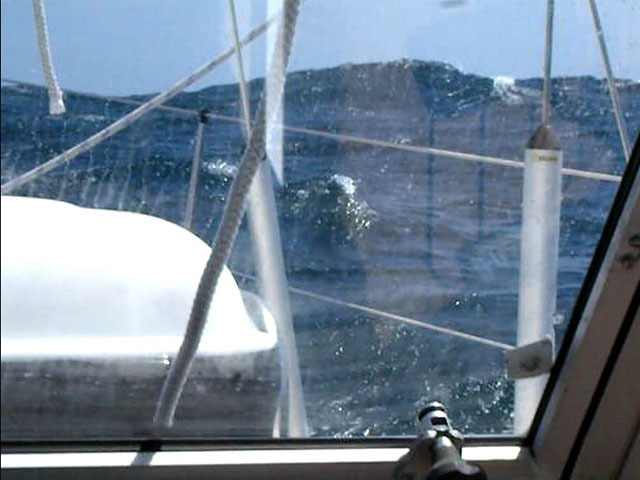 Only when bigger waves were lifting and pushing her stern aside to much, the autopilot had to do a heftier correction. At 22:45 yesterday we arrived in Baiona. The approach was impressive with all the lighthouses cardinal buoys directional and sector lights blinking and flashing in green white or red all around the area. We decided to stay for a day and explore the area. Tomorrow’s destination is Viana do Castelo. 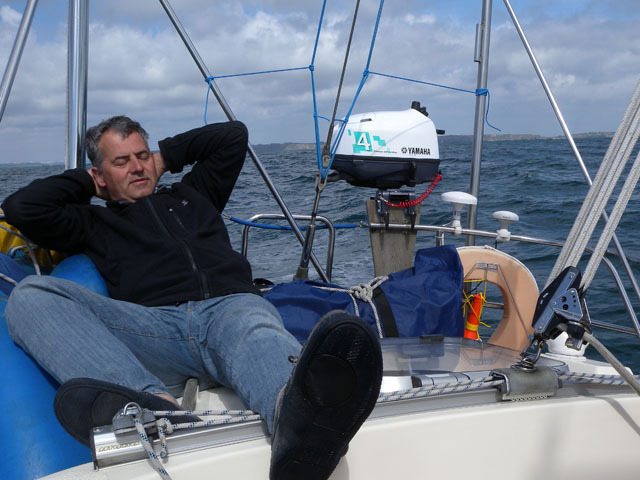 We motored out of Rade de Brest in order to fill our batteries (mains power supply was cut off last night before the departure and the batteries were only half full). It is recommended to make some way west first when leaving Brest and not directly head to La Coruña or the Spanish NW corner for the case the weather deteriorates. 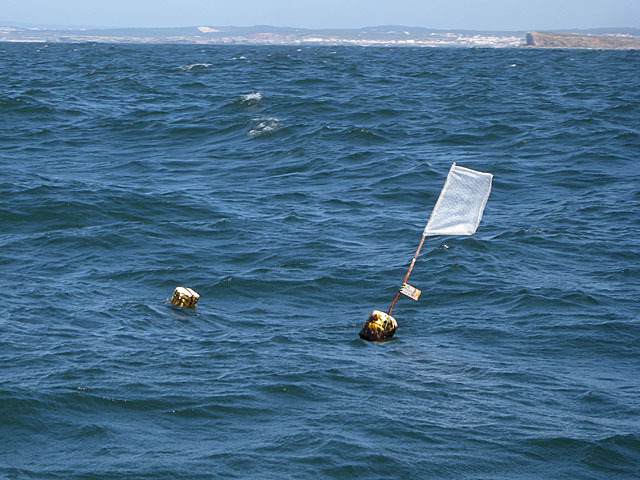 Doing so, the chance to keep clear from the continental shelf where huge waves can break in bad conditions is higher if needed. 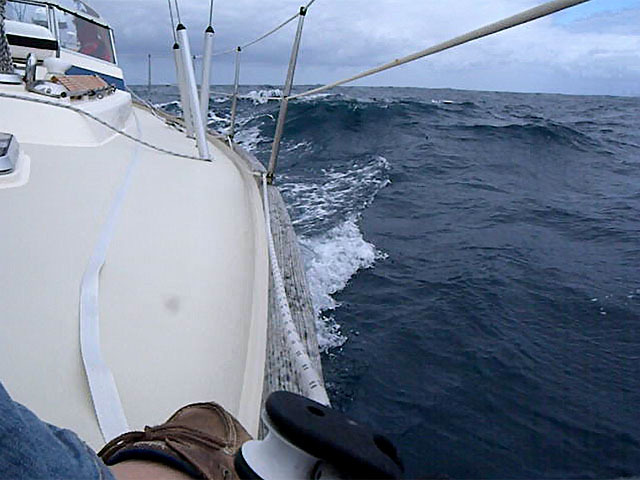 The wind backed (turned anticlockwise) in the night and we had to alter our course to S. Although the Bay of Biscay had been very kind to us till now with wind forces not exceeding F4, the old swell running in from the Atlantic was massive and the night was gray and cold as usually with one crew member suffering from sea sickness. Nevertheless, a nice constant breeze F4 had been pushing us all through the night. We passed the continental shelf at about 10:00 MEZ. From now on, it is “blue water sailing”, we have more than 3000m saltwater under the keel. Early in the afternoon the wind died away and we started the engine. Temperature 12°C, humidity 80%, the night was… (I am not going to repeat this…). 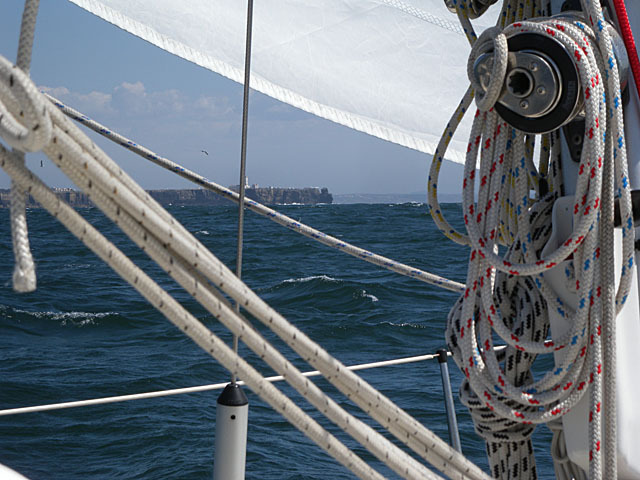 In the morning a fresh northeasterly breeze started to blow and we hoisted the sails again. The sky was completely covered by clouds and it was drizzling. 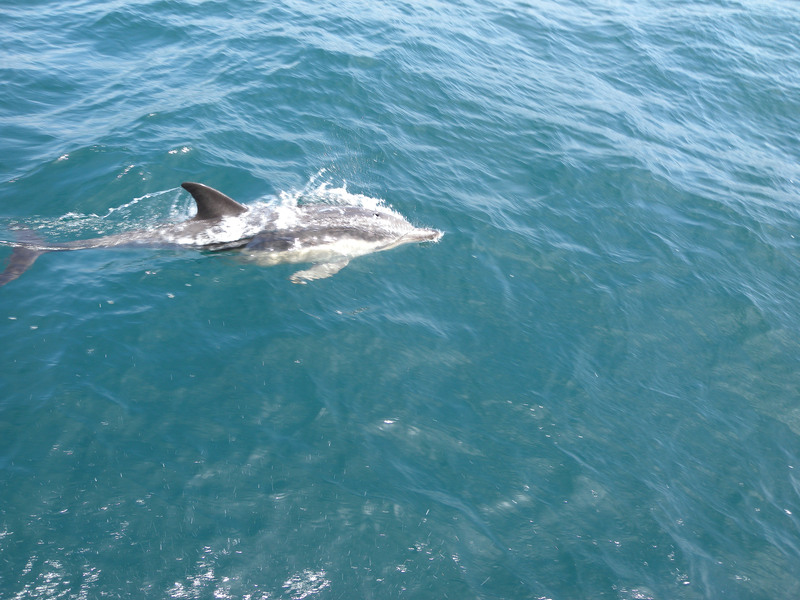 Many dolphins came along and raced at the bow for a long time. At about 12:00 we saw another sailing yacht in the distance overtaking us. 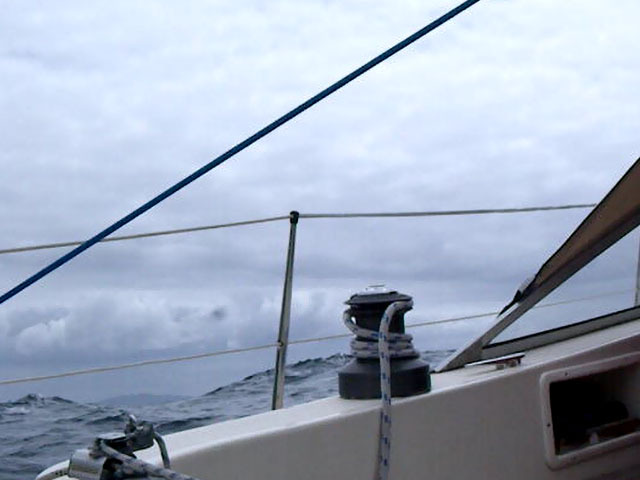 Visibility was poor and the sails of the overtaking yacht could only hardly be made out against the gray sky. 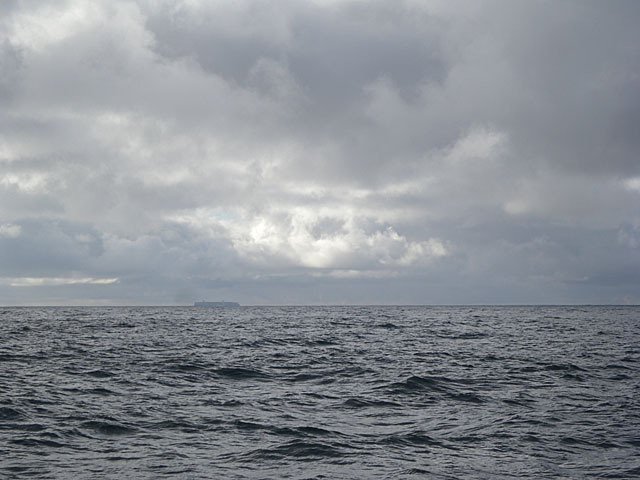 It was more “gray” than “blue water sailing” like in the English Channel. Later in the day the sky cleared and the sun came out. The sea turned deep blue. 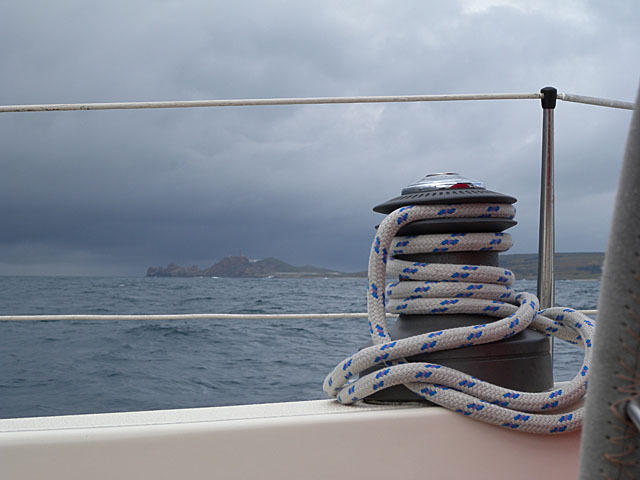 A northeasterly wind F4 was pushing us towards Spain and Cap Finisterre. We turned on the FM Radio and tuned to Radio 3. Spanish music and the warm afternoon sun laid a holiday atmosphere over the scene. We are almost in Spain. 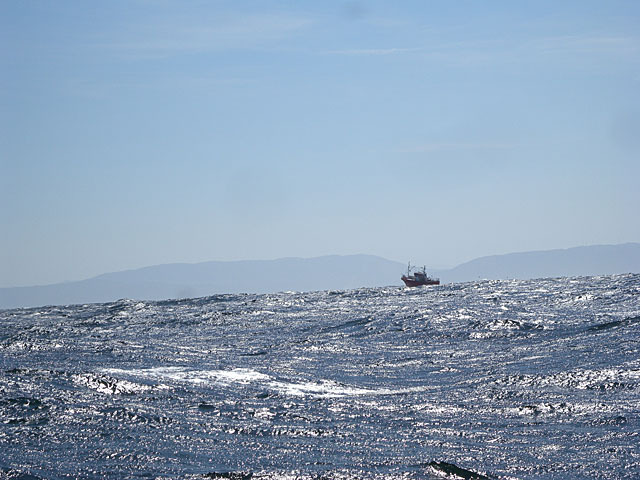 The night was clear most of the time with the sky covered in stars but the Biscay couldn’t let us go without giving us an idea of how bad the conditions could be in this area. It was blowing a northeast F5 (only…). The Atlantic swell mixed with the reflected waves in the bay and the wind waves now coming from NE and created a very chaotic sea with waves ranging up to 4 meters. In conditions like these relaxing between the shifts in the night is almost impossible. 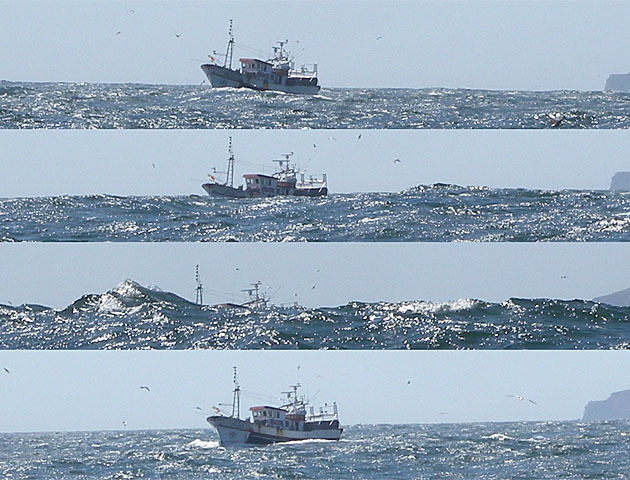 At about midday Patrick reported “Land in sight!” The landmasses of NW Spain became apparent at the horizon. 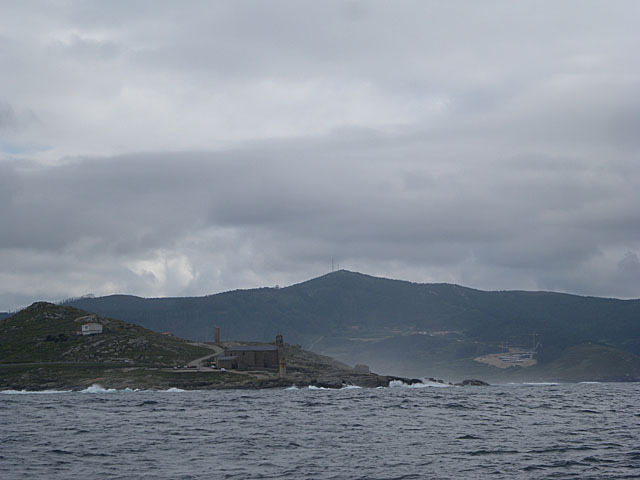 Because of a near gale warning and the expected bigger swell, we decided not to round Cap Finisterre this night but to make landfall to Camariñas. 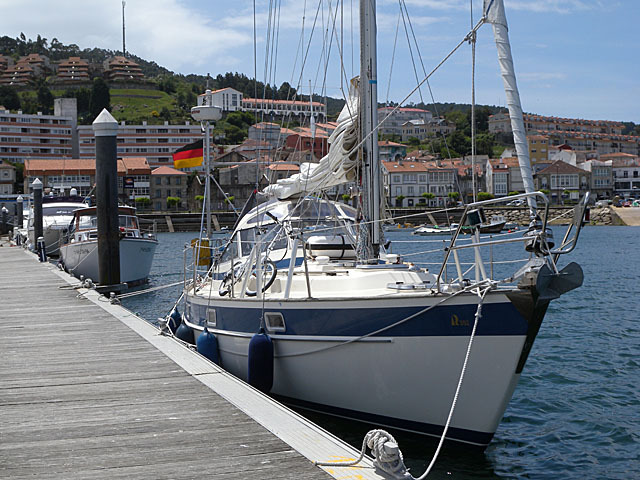 After a safe crossing of the Biscay, we arrived in Camariñas / Spain yesterday at about 19:00 in a downpour and gusting winds up to F7 (I love maneuvering in a harbour at F7…). The rain only started when we arrived in Camariñas. It was quite nice and sunny until 18:00. Preparing to leave for Baiona now. 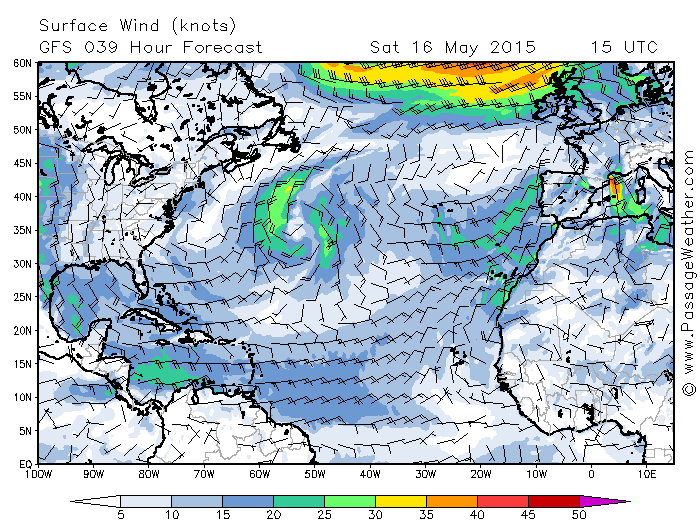 Forecast is F6 north and waves about 3m. 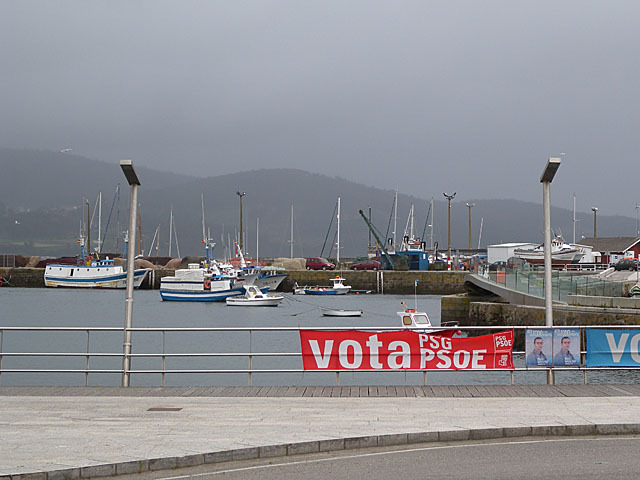 More details on the crossing with pictures as well as the trip to Baiona will follow later in the evening today. We are almost ready for the crossing. 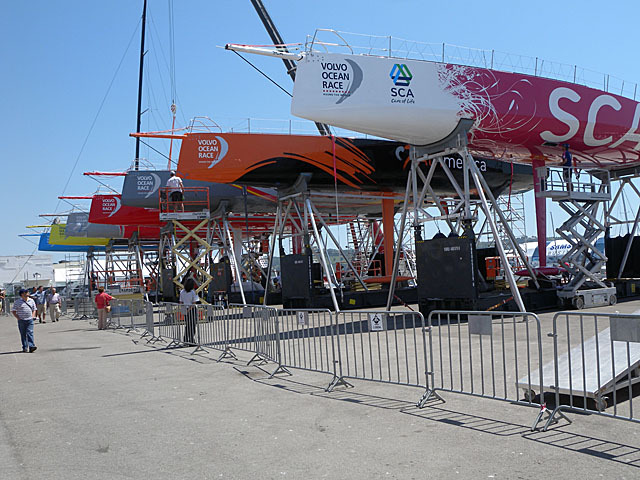 Fuel and water are filled in, the batteries are loaded, the engine is checked… Crossing the Biscay is offshore sailing and since we are doing this first time we want to be careful. The Weather situation seems to be quite comfortable. The wind is not expected to exceed F6. We are hoping for a nice and smooth crossing. Departure is going to be this afternoon. We estimate our crossing time to 4 days. Next blog entry will be 19th or 20th of May from Spain.